Back in April, I started a kid’s Makerspace. It’s been going pretty well, and one of these day I’m going to have to post an update about it, but today is not that day. Today, I’m going to talk about a maker program that I did a few weeks ago that ties in with the Makerspace. Makerspace Create is a monthly maker program for kids that I’ll be offering at my library. Starting in August, this maker program will be held in the actual kid’s Makerspace, but because we get SO MANY kids during the summer, I held the inaugural Makerspace Create in one of our larger meeting rooms. 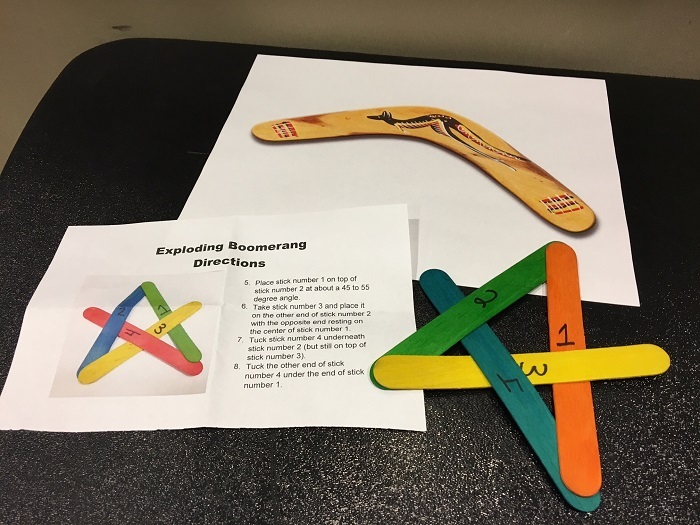 I also chose a project that was relatively simple, cheap, and could work well with a large group of kids of varying ages: exploding boomerangs. I got the idea for this project from I Can Teach My Child. If you follow the link, you will find super simple instructions for how to assemble the boomerang. I started the program by talking about boomerangs, what they look like and how they work. I would have liked to add a bit about the cultural and historical aspects of the boomerang, but this program took place during the first full week of Summer Reading, and I just didn’t have time to prepare and research, so I left that out. I then talked about the boomerangs that we would be making. I explained that the explosion wasn’t a chemical explosion with a puff of smoke (and there were some groans at that). Next, I demonstrated how to put the boomerang together. This demonstration is tricky and almost impossible for a large crowd, particularly because I can only do the fourth part by placing the boomerang on a table. Still, the kids got the basic gist of it. My program helper and I passed out little baggies that each contained 4 Popsicle sticks and instructions. I told the group to follow the instructions to make their boomerangs and to raise their hands if they were having trouble. Some kids caught on quickly and were able to assemble their boomerangs all on their own in a matter of minutes. Others were able to follow the first three steps and understood how the fourth step worked but didn’t quite have the fine motor skills for it (it is tricky…even for me). And a few were just plain lost. If you plan on doing this program and expect a large group of kids, you may want to either have extra helpers on hand, or have a simple craft (maybe coloring paper boomerangs?) that kids can work on if they assemble their boomerang quickly. After everyone was ready, I had the kids form three lines, and they took turns throwing their boomerangs at the wall and watching them explode. Some of the explosions were spectacular, with sticks flying everywhere, and there were a couple of times where the boomerang wouldn’t break a part, and I would congratulate the builder for making a super strong boomerang and give him/her another turn. Once the boomerang(s) exploded, the owners would rush forward to collect their sticks, and I had a rule that the next person in line couldn’t throw theirs until everyone was out of the way. Kids would then assemble their boomerangs again and run to the back of the line. We spent about 15-20 minutes exploding the boomerangs before I called for one last throw in which several kids lined up and threw their boomerangs all together. The kids were delighted to hear that they could take their boomerangs home, but I did tell them to ask their grown-ups about where they’re allowed to throw them. There are definitely some things I would do differently if I offered this program again. I would definitely add a little bit about the culture and history of the boomerang at the beginning, and I would make sure to have a project for kids to work on while they waited for others to assemble their boomerangs. But other than that, this program was a big hit with most of the kids, who loved the process of building something and then destroying it only to build it again.